Sometimes the mountain can be a pretty peculiar place. Whiteface Mountain is a local watering hole for those who might choose the path less traveled! Not sure what I mean? Let me show you. 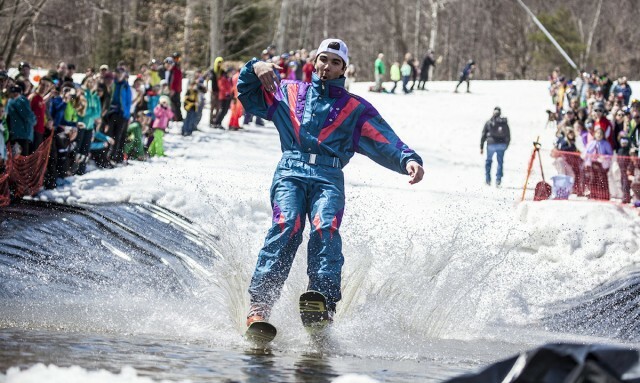 Every spring Whiteface Mountain holds their much-anticipated pond skimming contest. What’s pond skimming? The staff at the mountain makes a small pond at the bottom of the Mixing Bowl, you ski down a small portion of the mountain, and see how far you can skim across said pond on your skis! Sort of like waterskiing, but on a mountain! Sounds fun, right?! Let’s take a closer look! I forgot to mention that not only are you waterskiing on a mountain, but you're also doing it in costume. That is if you want a chance at winning the prestigious award of "Best Costume.” Of course, there are other factors to aim for as well including things like farthest distance, or biggest splash. Get creative because competition is stiff out there. You really don't want to be underdressed at an event like this. I would also consider working on your form beforehand. Pick which technique you think will work best to really make you fly. As shown above the knee-bend can be very effective in helping you skim as far as your skis will let you. Facial expressions are not required — but highly recommended for photo opportunities. A more laid-back approach can also be quite successful. A retro one-piece snowsuit, and a backwards hat could do the trick. Lean back a little, relax, and soar! I hope that suit is waterproof! Now you might think it’s rather peculiar showing up to the mountain dressed in a full-on costume, but around here it’s the norm. 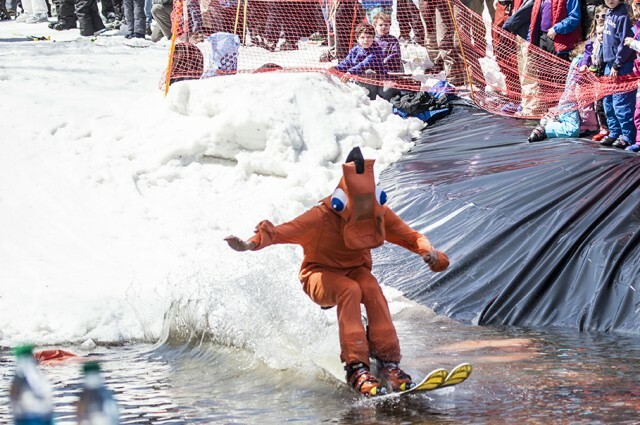 There’s nothing unusual about skiing down a mountain and skimming across a manmade pond in a Pokey costume! 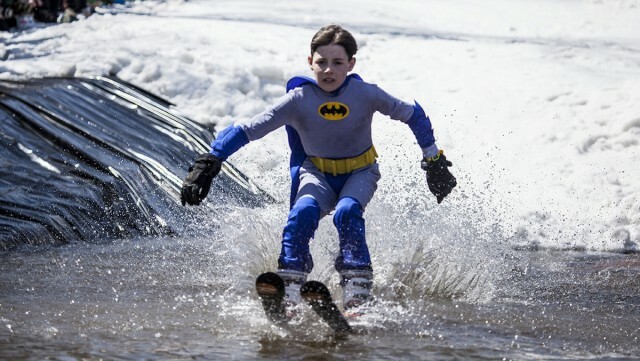 As seen here superheroes can pond skim too. No super powers required. It’s that easy. Maybe you’ll try it this year? 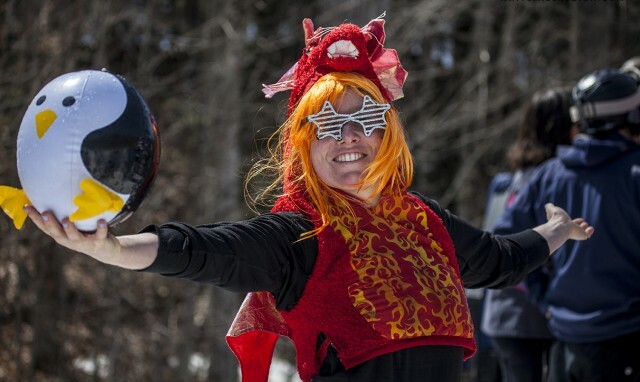 Now, aside from the pond skimmers, you might also see people like this walking around. A little peculiar, but still nothing we haven’t seen before. Besides, who doesn’t love a good neon windbreaker or a baby-blue tuxedo? It just wouldn't be right if there wasn't entertainment provided to continue a day of fun at the mountain. Even the local regional bands that play at the mountain can be quite colorful. Like I said, the mountain on occasion can be a local gathering spot for some pretty peculiar people. As seen here. Tutus in the winter? We say, why not?! 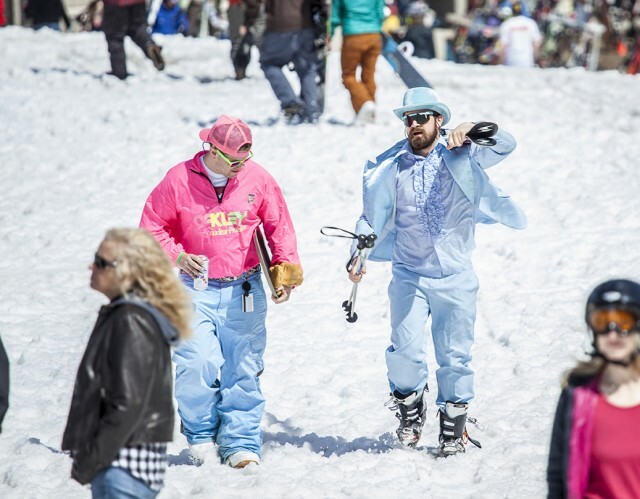 The combination of skiing and riding, music, dancing, and strange costumes makes for one very unique, very exciting day at the mountain. Last year the annual pond skimming competition was a part of Springfest, a Whiteface Mountain event. Of course, there are a lot of events and chances to dress your best and dance the night away with our colorful cast of characters before spring hits! Start planning your trip, stay close to the mountain, and browse our other Whiteface Region events where you might run into some pretty colorful people!